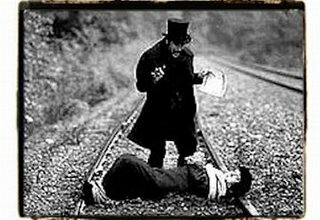 This week’s blog series, “Railroading Runkle Canyon?” will continue into next week because of the sheer amount of material we’re covering. Three more posts will cover the Runkle Canyon cleanup plan public comments by Bill Bowling, D’Lanie Blaze and EnviroReporter. A fourth blog post will look at all these comments and what they may mean for the new toxics department honcho in charge of the “cleanup” of Runkle Canyon and the Santa Susana Field Laboratory, Rick Brausch. Riley’s departure was met with mixed responses from the community, but we were heartened by acting director of DTSC, Maziar Movassagh’s affirmation that the department considers the Rangers’ and others’ comments helpful. “This department takes the public comments very seriously,” Movassaghi told EnviroReporter.com. “We’re going to look at Runkle Canyon with clean eyes. We are not going to delay this [voluntary cleanup with KB Home]. It appears that the location of this $46 million-and-counting cleanup of unexploded bombs, munitions and depleted uranium shell fragments has moved onto the Greg Norman Signature Golf Course at the Vellano Country Club! 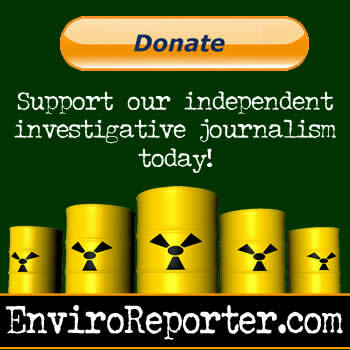 EnviroReporter.com isn’t actually a “public stakeholder” – that’s a designation usually reserved for residents, businesses and environmental groups that have an interest in the sites DTSC makes sure are cleaned up. We are an environmental news website. But what the hey, huh? It’s gratifying that the department would look at EnviroReporter.com’s blog to find out it had posted four maps that showed Aerojet Chino Hills, a contaminated Cold War-era facility, located next to the putting green on a fancy golf course. So it was with some surprise that we went to the Aerojet Chino Hills map page, under the “Map” tab, only to see that nothing has changed. Sure enough, even now, three weeks after getting that snail-mail letter, the DTSC Envirostor page hasn’t been touched and the polluted complex lies yards away from the tony golf course’s clubhouse. Aerojet has completed all required corrective actions relating to chemical impacts to soil, surface water and subsurface water. This year, DTSC accepted clean closure for the former Open Burn/Open Detonation unit of the Aerojet Chino Hills property, where Aerojet treated ordnance (under permit from DTSC) that did not meet military specifications. Apparently, DTSC’s Cypress office didn’t consider even one of EnviroReporter.com’s 15 pages comments about the OB/OD unit submitted May 1 to the department. This defies common sense and the letter of the law. Our comments show that the “clean closure” for the OB/OD could be premature and a threat to humans, animals, water supplies and the environment. No amount of hiring and firing or personnel changes in DTSC will make a difference if the department itself is plagued by institutional ineptness. Taxpaying community members, especially those in living in polluted areas, deserve better. Wow, this is crazy and how no one ever mentions it when they talk about chino Hills. We moved here about 2 years ago right off glenridge/pipeline and frequently take our little ones to go play at the newly built gorgeous Vellano park, after reading these articles we aren’t going there anymore. Sounds like a half-a$$ed cleanup job. And to think people are buying home in the Vellano community for $2-4million, I didn’t know uranium was so cheap to live by! They got a bargain! Anyone with more info regarding Aerojet and the exact communities that are affected in chino hills please email me at richard.ramirez21@gmail.com. @Wayne: Yes there are updates regarding Aerojet in Chino Hills that we will be reporting on. Thank you for your continued patience about this controversial property that has such a dubious history. Are there any update regarding Aerojet in Chino Hills CA? Also, any tests have been done regarding water & soil ? THanks. You can get in touch with me or email your stories to me at chinohillscommunityvoice@gmail.com. I am attempting to see if enough people come forward with their stories to conduct a comprehensive study on the affects Aerojet has had on the community. I am a long time resident of chino hills myself and have realized that many of these stories have been brushed aside. Taken all together they hold much more power and insight as to the damage that has been done to our community. Are any of you that have been affected by Aerojet still residents of chino hills? I’m interested in looking into how Aerojet has affected the community of chino hills and impacted the residents. There does not seem to be one central collection that includes all the resident’s stories and complaints. I’m looking to draw a more comprehensive picture of the long standing impact Aerojet has had on the community. Family members, workers, neighbors, or just long time residents of chino hills, tell me your story. @David Walker: We are so sorry to hear of these illnesses in your family. At the present time we know of no new cases related to Aerojet Chino Hills. But if you do a thorough search and find there is an active lawsuit, make sure to tell us about it. Lived on ashbrook from Dec 93-June 96. My wife at the time developed colon cancer 2 years ago at age 51, and her daughter developed lupus and other serious neurological disorders and is taking chemotherapy. I have had serious gastric issues, duodenitis, gastritis. I learned last week of Aerojet. Now all of these health issues make sense. My stepdaughter wants to know if there is a law firm that is currently taking any new cases related to Aerojet. How do I find out for her? Look further and investigate – there may have been a class action on Aerojet. This is a serious matter and not to be taken lightly, remember that case on Erin Brokovich? See my comment post of July 24 about my husband’s and his daughter’s cancer diagnoses. His ex-wife has suffered undiagnosed symptoms for years. Unable to work. In constant pain. Migraines. Has gone from doctor to doctor to doctor to try to find out. Cannot get a determination. Recently given lupus diagnosis without confirming blood work. Lupus does not show up well in typical blood work so you have to go by symptoms. I am sure you have checked Lyme disease by now. Take good care. I am also the spouse and caretaker for my ill husband. I had to leave work. It’s a total shock and sad to watch. My husband bought in one of original tracts in Chino Hills. Lived there a decade at least. His daughter died of an osteosarcoma in her jaw in 1999. He was just diagnosed with pancreatic and liver cancer. There are significant autoimmune disorders in his family including his granddaughter… the daughter of the daughter who died. Some precancerous skin anomalies on his other adult daughter. Coincidence?????? @Izea Benavides: We are so sorry to hear of your illness but can tell from your comment that you have plenty of go-power and perserverance. Please read our entire Aerojet Chino Hills investigation if you want to see how the California EPA’s Department of Toxic Substances Control has dropped the ball by failing to address comments made on the incomplete cleanup of the site. This knowledge is power. Share it with the women you note and then please tell us what you think and what you want to do. Recently diagnosed with Stage 3 Esophageal Cancer at age 39. No previous symptoms of, no family history of Cancer on November 2012. I am a healthy filipina/american. Lived in Chino Hills since 2003 near Soquel Canyon. Prior to my diagnosis, I was a avid health freak, run 5 miles 3 days a week around Butterfield Ranch Road and also Peyton/Chino Hills Parkway area. I cycle 2 days a week, at the LA FITNESS gym in CHINO. Reading about and being aware of AEROJET CHINO HILLS is all new to me. This is scary, especially since I know of 4 other women, all under age 40 and all live within miles of each other–with different types of cancer–myself with Esophageal, another friend (recently died at age 38–common bile duct carcinoma, another friend with ovarian cancer, and another with breast cancer. all of us under age 40 and live close to where Aerojet used to be–the now Vellano Country Club area, where the million dollar custom homes are. This makes me sick to my stomach. @Kris: Unfortunately, the government’s dismissal of many of the radiation and chemical contamination problems at this site also means that it hasn’t (and won’t) produce a list of the effected communities (that is if there are any at all). Use your common sense, Kris. I am planning to buy a house in Chino Hills. Are all communities effected or certain communities? Is there a list of affected communities? like to get more updates on what they are doing to clean up or hide I live and work very close the vellano. I am planning to move to Vellano community. What will be the risks to live there? @ Kym Hubert: You’ve come to the right place for more information on Aerojet Chino Hills. We hope that the information therein may lead you to answers about your husband’s unfortunate condition. Please keep us advised. @ Potrblog: Your admonition for folks near North Anna Nuclear Plant to protect themselves, at the very least, with IOSAT personal radiation detection devices is laudable to say the least. Your continued sage insights, knowledge and advise have been invaluable. THANK YOU. My husband and I lived in Chino Hills for 13 years, not far from the Aerojet plant. We moved to So. IL in 2003; however in 2002 my husband, Rick, became severely ill with an “as yet undiagnosed” illness that has been devastating for him and his entire family. We just saw this website and are eager to get more information. We met with another neuro doc yesterday as we have never given up trying to find help for Rick and his MANY symptoms. Rick was training for the LA Marathon, running in the Chino hills (near Aerojet) in May of 2002 when he came home with “flu like symptoms” only to be followed by hospitalizations, multitudes of tests and years of devastating problems. We believe his illness is a direct result of inhaling whatever was being “sifted” at that time when he was running in the area. We would be interested in getting more information.